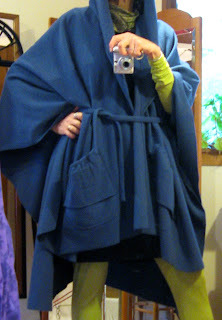 Grandmother GG's Karakul Coat --Remodeled! 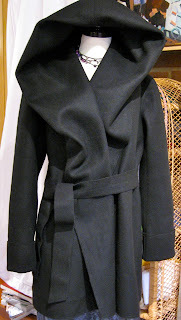 One of my favorite customers brought her GG's Karakul Coat in to my studio. Could I make it 8 inches shorter? 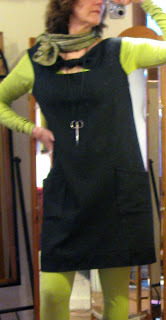 Could I re-shape and shorten the sleeves? 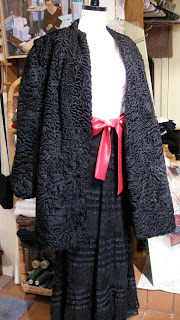 Working on this beautiful coat, I was amazed by the lovely lining and the labor-intensive hand-stitching throughout. That gorgeous lining is completely underlined with soft cotton flannel. The skins, even tiny pieces as they are, are all perfectly pieced. My mid-1950s friend loves this project. "MOR", she says, "mor". And most amazing of all, I found an imprint inside the sleeve. I can't read it too well, but besides HOLLAND, it says "FOR LASTING LOVE". You might not even believe me, but for this photo. Thank you, Cheri, for letting me work on your dear GG's coat. May she rest in perfect peace. Ready for some wedding pictures? Don't miss these! For one thing, more pictures of this chantilly lace dress are coming soon. 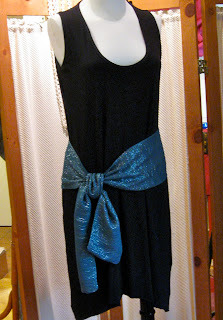 Have I ever been having fun lately, creating a DRESS. 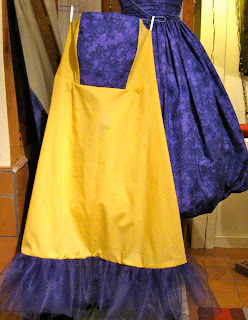 Purple tone-on-tone printed cotton, shaped into a marvelous Princess Dress..... My first photos show how the dress was shaping up, before I added the sunshine yellow lining. 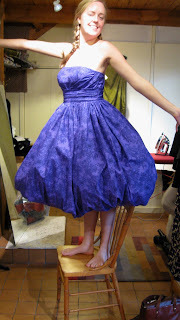 I finished the dress; its Princess came by my studio to model it and to pick it up for the party. I am so proud to introduce Sarah Elizabeth to everyone. She celebrates life and beauty over at www.loveinfinitysquared.org, where you can become better acquainted with her and her story of living with cancer. Never doubt the power of LOVE. 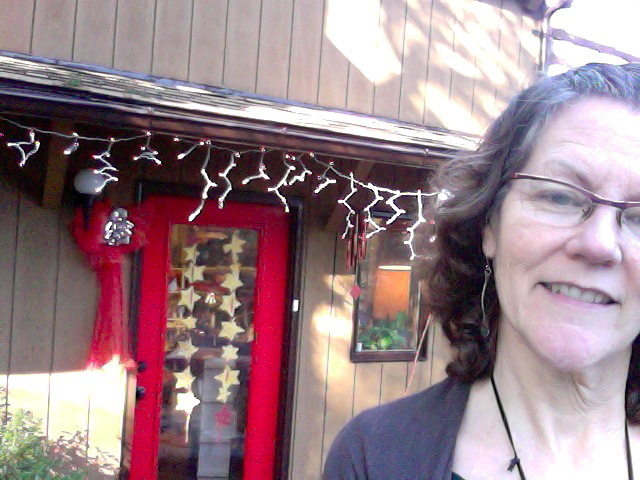 The KathleenTemple, Tailor Studio has been open for one year now, and there are many dozens (maybe hundreds!) of custom garments I haven't shown you yet. 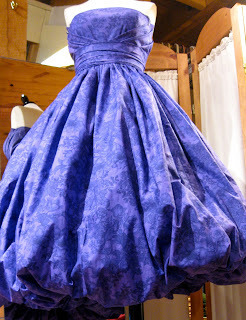 I want to trot out a few of the custom dresses and such to give you a taste of what I have been doing. This little black dress is a simple tank style dress with a contoured hem. It is of a luscious soft bamboo interlock knit. 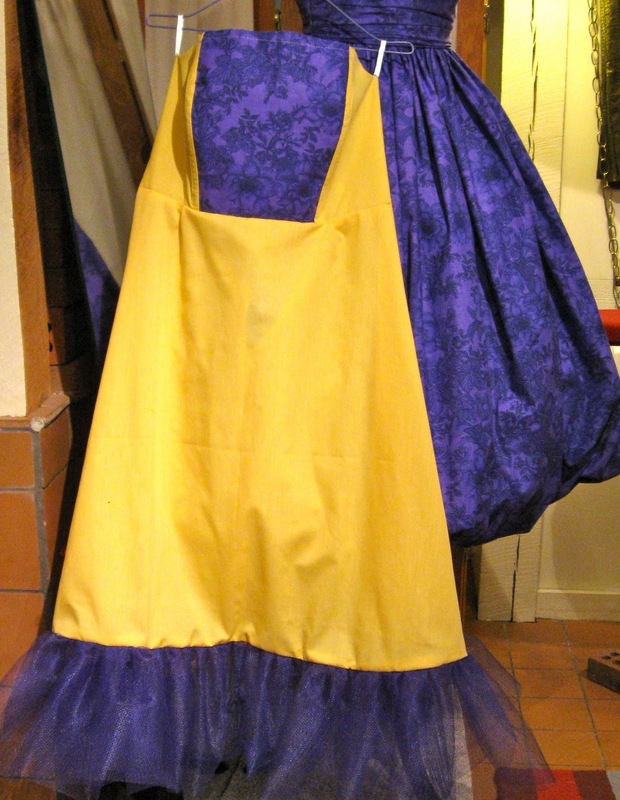 I created the silk sash after I shortened a silk dress-- the customer for whom I shortened the dress allowed me to recycle her excess hem fabric! I created this terrific hooded wool coat for a customer and liked it so much myself that I ended up making a wool lace vest for myself with the same type of hood on it. 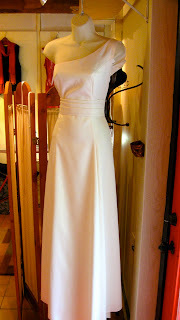 I have made many custom wedding gowns over the past year. 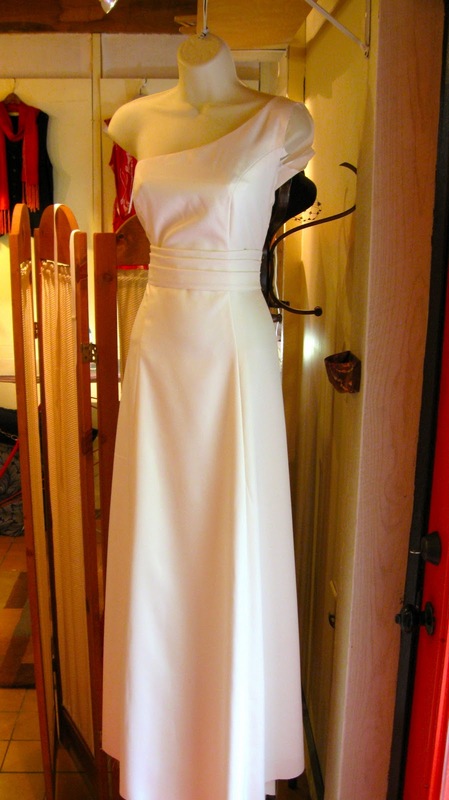 This vintage style gown is stunning in person! 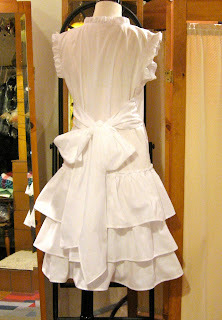 I will share photos of the beautiful bride wearing it once I receive them. Am I lucky or what?? I get to make very fun costumes for a young woman who wears them to Japanese animation conferences! This dress transforms my customer into a human version of a certain Anima character. 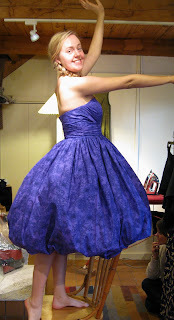 A whole troop of bubble-skirted bridesmaids' dresses in hot pink taffeta! 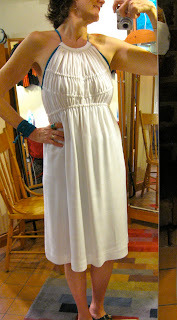 I made this dress about a zillion years ago, but I love it so much I couldn't leave it out here.... Of course I matched the stripes perfectly (I LOVE to match stripes). Enough of the photos I took myself, eh? The last few photos I will show today were created by the talented photog Chelsea Weaver. Chelsea herself is modeling here. Kelsey Landes is modeling my blue stripe number. Do subscribe to KathleenTemple, Tailor, will you? There will be more photos coming soon. Thanks!